…..AND creating Exponential Hope and Healing in the world. 12 days after the San Bernardino terror attack in December 2015, our volunteers began to hang Stars of HOPE at the shooting site to transform a place of darkness into a place of light and hope. Two weeks later, hundreds of Stars of HOPE painted by people of all ages from across the U.S. were hung at the site of the terror attack through the Stars of HOPE Box of HOPE program. This outpouring of compassion from everyday people in their homes and places of business in the immediate aftermath of an historic tragedy started a chain of events that helped to accelerate the healing process of those directly impacted by the terror attack. 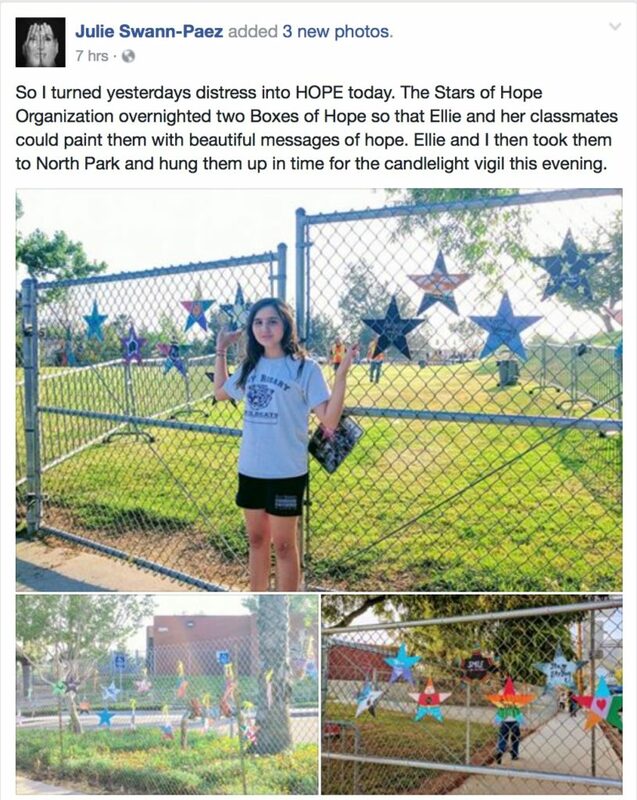 Yesterday – AND JUST 24 HOURS AFTER THE LATEST TRAGIC SHOOTING AT AN ELEMENTARY SCHOOL IN SAN BERNARDINO which took the life of a teacher and 8-year-old child – Julie Swann Paez, a survivor of the 2015 terror attack EMPOWERED HER 11-YEAR-OLD DAUGHTER’S CLASSMATES to paint Stars of HOPE which they then hung at North Park Elementary School to transform another place of darkness into a place of light, hope, and love. We empower survivors to heal by helping others. We empower people of all ages to express their compassion through creativity and connect with those in need of hope. This process starts a viral and limitless chains of hope and healing. And we are now making it possible for people directly impacted by Stars of HOPE to help lift the spirits of others impacted by tragedy within 24 hours. Stars of HOPE is working….and growing….exponentially.